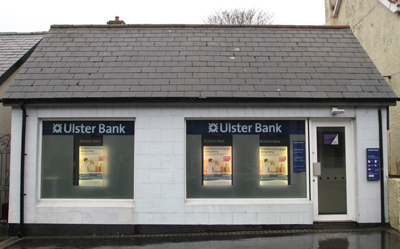 THE Ulster Bank will be closing a number of its local branches across Northern Ireland and in the Republic of Ireland. This has created widespread political furore and two MP’s in County Down have already fired broadsides at the Ulster Bank asking for the rights of rural dwellers and businesses to be upheld. The closures are part of an intended raionalisation of approximately 20 branches and sub offices. Although there are no further intended job losses planned, the general concern is that in these rural areas will suffer the loss of this service which will be felt more significantly by many people and businesses who depend on their local bank for a number of services. SOUTH Down MP Margaret Ritchie has criticised Ulster Bank for double standards after it was reported that a branch in Ardglass is earmarked for closure. She said that this comes despite assurances from the bank that it would not close a branch where no other banking institution existed. Ms Ritchie said: “There has been considerable discussion about the role and intentions of Ulster Bank in the provisions of services to customers over the last number of months. “Quite some time ago, customers faced the uncertainty over the computer problems when they were unable to access their money or even know what debits were made from their accounts or even know the balance. did not have an outlet. The Ardglass Ulster Bank branch is likely to close under the current rationalisation plans affecting banks across Ireland. “Now, it seems that Ulster Bank may have broken their own undertakings in the case of our local fishing port, Ardglass. The branch located in Ardglass in Bath Street has been earmarked for closure. There is no other banking institution in that fishing village offering full services. It is important that this service is retained in Ardglass to accommodate the banking needs of people in the area. “I have now written to Ulster Bank asking them to honour and uphold their previous commitment and ensure that residential and business customers in Ardglass have access to proper and adequate banking services”. Strangford MP Jim Shannon has voiced his anxiety about the threatened bank branch cuts affecting Saintfield and Carryduff, and said: “The Carryduff branch will have accounts transferring to Ormeau Road, with the sub office of Saintfield also facing closure will cause issues for that area. “Although Ulster Bank have issued a statement saying that they are working to provide alternative service channels such as ATM, telephone, online , mobile and through the post office, it is clear that this will be disruptive to the vulnerable and I will be asking that rather than being just sent a letter, older people are given the opportuunity of having this explained face to face.